Project obstacles and solutions: In 2014, INDOT began work on a $15.6 million resurfacing project on U.S. 41 from Coal Mine Road in Fort Branch, Indiana to the Boonville-New Harmony Road in Evansville. The multi-faceted project included bridge rehabilitation, extending and adding turn lanes, deep patching, milling and resurfacing over ten miles of four-lane highway. 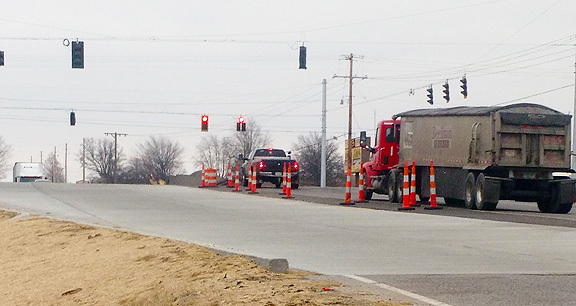 One of the biggest undertakings of the project was the replacement of asphalt with concrete turn lanes at the U.S. 41 and Warrenton Road intersection in southern Gibson County. This intersection gets a lot of heavy truck traffic. The existing asphalt was severely damaged. Both the turn and driving lanes of the intersection were deeply rutted. River Town Construction performed all of the concrete finishing work for the project. This required milling out all of the old asphalt and providing a full-depth rebuild of the lanes. To accommodate the heavy loads, the intersection lanes were poured 12-14 inches deep. River Town formed up each lane and used a power screed to move the concrete into position before floating and troweling it. Extra care was given to ensure the concrete was properly set up before forming up a new lane. Safety was a big key on this job. Due to traffic patterns, a lot of the work was performed in the early mornings and late evenings. IMI supplied up to 500 yards per pour. In all, this intersection rebuild used over 3,000 yards of concrete.